By Billy Ludt | January 12, 2018 at 12:05a.m. For Steven Ward, an Austintown Fitch High School English teacher, students who take the time to get involved with in-school clubs outside of class deserve recognition. On Thursday evening, those students were showcased in the school’s fourth Annual Creative Arts Night. Fitch’s media center, art wing and lunchroom were filled with school programs and student clubs who set up tables to show what their club or program is all about. Ward supervised, but said the students did all the legwork putting together the event. The two student managers who headed that effort were juniors Tianna Amann and Alissa Baxter, who are both in Ward’s life literature class. The two said they’ve known about the event for a while, but preparations required about two straight weeks of work. 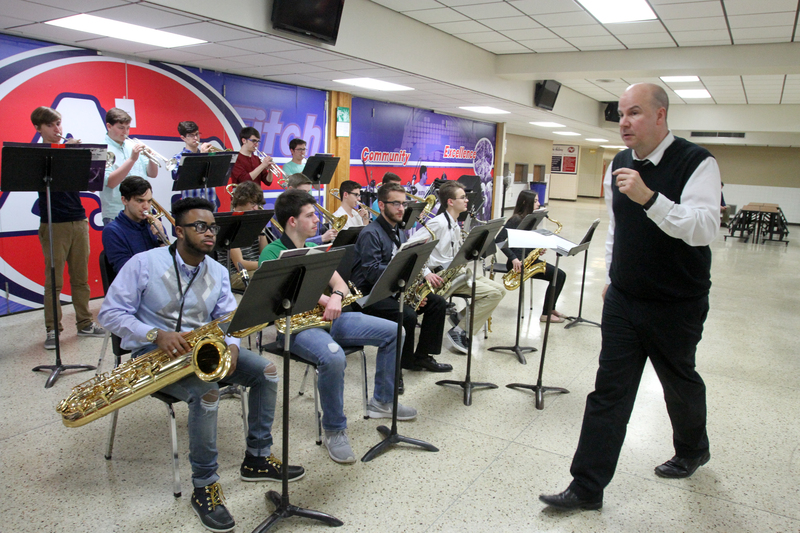 “I just think it’s cool to let students have the opportunity to express themselves outside of school,” Amann said. There were about 20 clubs and programs represented at Creative Arts Night. The school’s foreign-language clubs showcased respective cultures and cuisine where the dialects hail from; the National Honor Society made sundaes to raise money for the New Lease on Life Animal Shelter; the art club helped people make school-themed keychains and screen print T-shirts. The high school’s student newspaper, The Talon, laid out clippings from past issues. Fitch’s band, choir and orchestra performed, and there were demonstrations from the school’s speech team, robotics team and Science, Technology, Engineering, & Mathematics program. “I wanted to explore different career opportunities,” junior Marcellena Ceja said of STEM. The program showcased items made using additive and subtractive manufacturing, as well as model vehicles students made to traverse simulated courses. “I just hope that it gets more people involved in the program,” Ceja said. In middle school, David Varley III regarded Fitch’s theater productions with awe. He knew he needed to get involved when the time came. Now the drama club’s president, Varley and fellow club members are preparing for a production of “Beauty and the Beast” on the weekend of April 20. Varley, who is playing the Beast, handed out fliers for the show and spoke to students about the drama club. January 22, 2016 12:04 a.m.
January 11, 2018 10:55 p.m.